Virgil & Owen by Paulette Bogan | What is ML Reading? 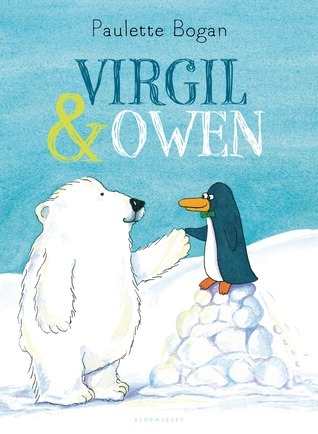 The cover of Virgil & Owen by Paulette Bogan includes a polar bear and a penguin. I asked ML, “Which do you think is Virgil? And which do you think is Owen?” She guessed correctly. Her reasoning was impressive. The text for Virgil’s name on the cover is darker. The text used for Owen’s name is white. Can you guess who is who based on this clue? Another fabulous picture book about friendship. This time featuring the challenges of a friend wanting undivided attention. The simple text and engaging illustrations make it a perfect read for preschool teachers to their students. This entry was posted in Picture Book and tagged Paulette Bogan, Virgil & Owen by mlreads. Bookmark the permalink.